If you’re anything like me, you’ve discovered the benefits of Amazon prime! The one-stop shop even allows you to set up monthly deliveries of things like detergent or groceries, and you can basically knock out all your christmas shopping in one sitting with your smart phone! Amazon has grown and grown to include everything from organic products to inexpensive party supplies, and you can always snag a good book or two! Best of all, prime members get their purchases in just two days. But one area that is often overlooked with Amazon, is the home decor selection. They have the most amazing decor items, at super affordable prices! Here are my picks for holiday decor that will arrive quickly to your home, and look like you spent hours searching it out at expensive department stores! -Christmas Tree Pillow: this high-end looking pillow is under $10, and has free prime shipping! 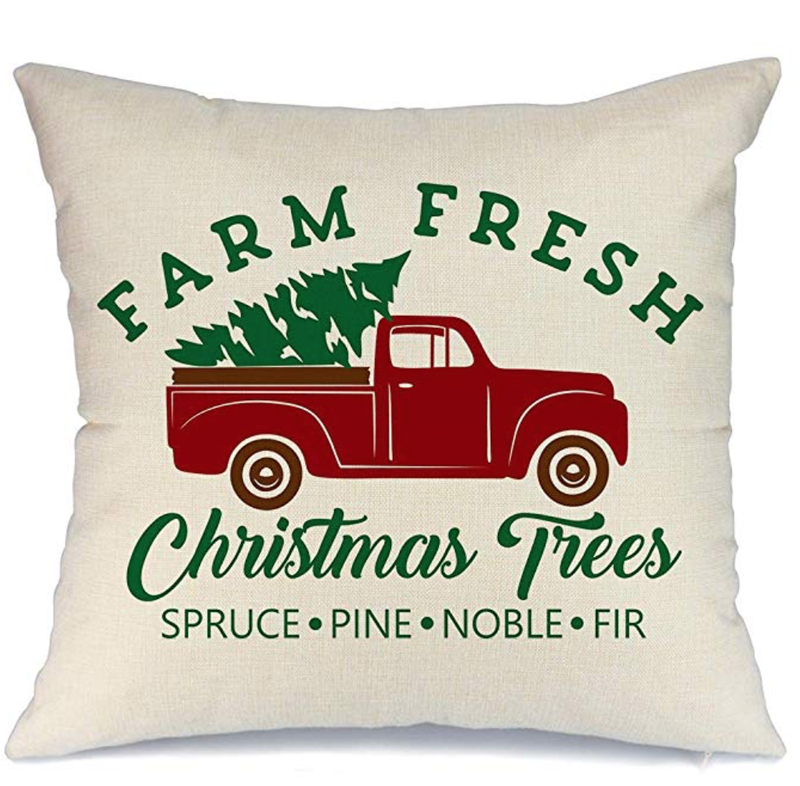 The cute print and little truck/tree design is perfect for any farmhouse inspired decor scheme, and best of all, it is 18x18 and slips right over your existing pillows as a slipcover. This means you can save space and utilize what you already own. Find it HERE. 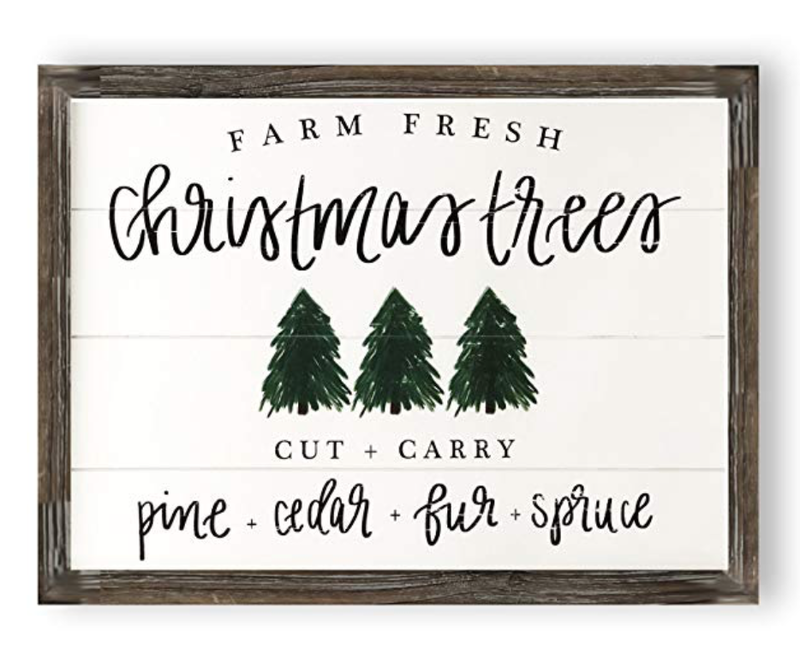 -Rustic farmhouse sign: This is a great price, and looks adorable. It is really well made and is under $70, which is pretty affordable for a large sign. It also comes with two hooks for easy hanging and decorating, and looks good with any color theme, because it is such a pretty neutral. At 18x24”, it is large enough to make a big impact on your christmas decorating! Find it HERE. -Plain burlap stockings: These are somewhat on the thin side, but they accent your existing decor really well, and they are just $12 for three stockings! They look great in front of a fireplace or hanging on a mantel, or you can fill them up and give them as gifts to teachers or friends. They are like a blank canvas, since they are just a simple tan and white design! Find them HERE. -Large christmas wreath: Wreaths can be quite expensive, and many are gaudy. This pretty, flocked artificial wreath is the best idea for your front door or even inside your home, layered on a big mirror or windowpane. It’s also filled with enough neutral greens and whites that you could use it year-round or add a little sparkle with added ornaments. It’s a bit spendy at $53, but pretty comparable to any other type of wreath you may find at Target or Home Goods. It’s available HERE. As you can see, Amazon has tons of pretty christmas items, that are all affordable! Best of all, you don’t have to leave the comfort of your own couch to find them!